No special times are set for summer final exams, contact your instructor for more information. Final exams in courses of two or more credits may not be given at a time that differs from the exam as scheduled by the registrar. An instructor may not give a final exam prior to final exam week nor change the published time final examination as it appears in the final exam schedule. Permission to change the time for which an exam is scheduled may be given only by the dean of the college. If the instructor elects not to give a final exam, the class is required to meet at the scheduled final exam period for other educational activity such as a review of the course or feedback on previous exams. With the exception of special group courses, time for examinations is determined by the student’s first contact (beginning of class time) of the week in each course. Special group exams will be scheduled after the semester begins if appropriate exam times and rooms can be arranged. When using this tentative schedule, refer to the list of probable special group exam courses. This list of group exam courses is subject to change. For courses which are all recitation or lecture, or which have one or more recitations or lectures with one or more laboratories, the first recitation or lecture of the week is considered as the first contact of the week. In courses having both recitations and lectures, the department head may determine whether the first lecture or the first recitation is to be considered the first contact. When determining first contact hour, look for the beginning of class time in the ranges listed. For example, if the first contact time is Mon. 11:00 a.m., look for Mon. 10:30-11:29 a.m.; if the first contact time is Tues. 12:40 p.m., look for Tues. 12:30-1:29 p.m.; if the first contact time is Tues. 1:10 p.m., look for Tues. 12:30-1:29 p.m. Courses with lectures scheduled at 6:00 p.m. or later should give their examinations during finals week from 7:00-9:00 p.m. on the day the class normally meets. Courses with a first contact hour not listed on the exam schedule are to have examinations during finals week at a time to be announced by the instructor once rooms are secured through Room Scheduling. Examples include courses with a first contact time on Tuesday between 11:30-12:29 p.m., classes with first contact time on Mon. or Tues. between 4:30 - 5:59 p.m., or courses with a first contact time on a Wednesday, Thursday, or Friday. For courses that are not listed on the exam schedule, the exam time is to be announced by the instructor. If the instructor arranged exam time causes a student to have two exams at the same time, the student may request to reschedule the instructor arranged final exam. The instructor of the arranged exam is responsible for offering an alternate examination time for the student unless make-up exam times are available in the other course. To reschedule, the student must notify the instructor prior to the last day of class before the beginning of dead week so the instructor has time to make appropriate arrangements. Examinations will be held in the meeting place of the first contact of the week, except those in special groups. For the special groups, the place will be announced by the instructor. Students who have three or more finals on the same calendar day may request to reschedule a final. The instructor of the course having the smallest number of students is responsible for arranging an alternate examination time for the student unless make-up exam times are available in one of the other courses. To reschedule, the student must notify the instructor prior to the last day of class before the beginning of dead week so the instructor has time to make appropriate arrangements. 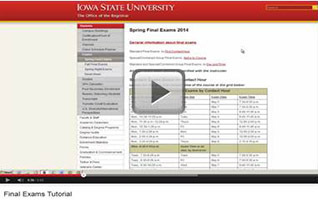 For information regarding the online testing center please visit http://www.testcenter.iastate.edu/.